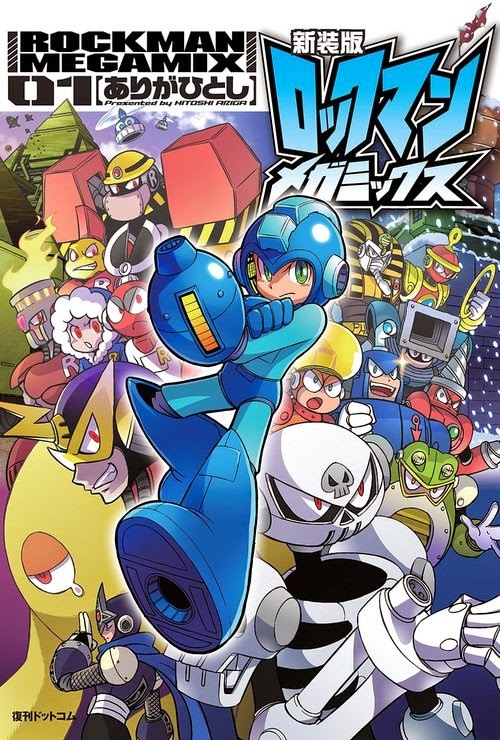 Hitsohi Ariga's acclaimed Rockman Megamix manga series is making a comeback. A new edition of the first Megamix entry will hit stores in Japan on March 18th. 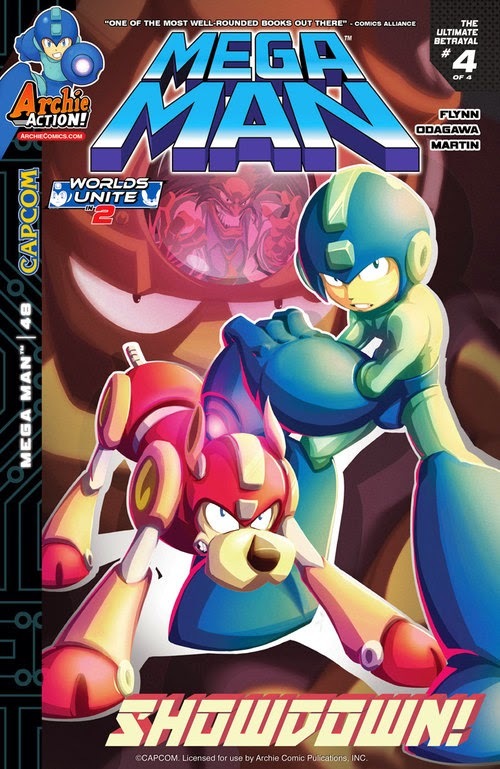 It includes brand new cover art, retouched panels and scenes, a behind-the-scenes interviews, and "Rockman Writing Secret Story," a collection of anecdotes from Ariga from when he was writing the story. For collectors, the big draw here is the new cover. And while the prospect of updated art sounds interesting, we're not too sure how extensive it will be. It wouldn't be the first time, though. 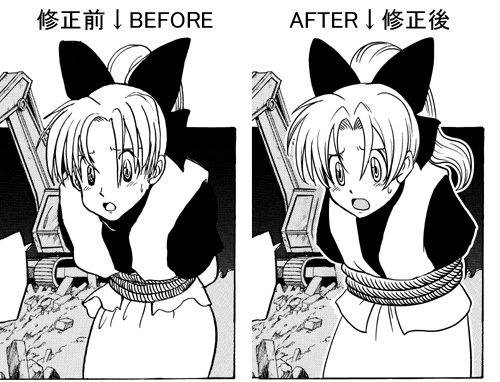 Hard to say if these new additions/changes will warrant a reprint here in states (courtesy of UDON, no less). If you're interested and have the means to do so, you can preorder the book from E-Capcom for 3,600 Yen (roughly $30.45 US). It comes with a free postcard! 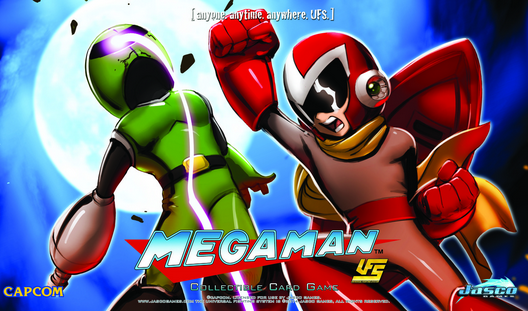 New Mega Man UFS Expansion Revealed: "Rise of the Masters"
A little over a year ago Mega Man joined Jasco's collectible card game Universal Fighting System. This year, Jasoc Games are beefing up the Blue Bomber line with "Rise of the Masters", a new set of decks and cards due in March. Get a sneak peek after the jump! You've seen the stock photos now check out the real deal. 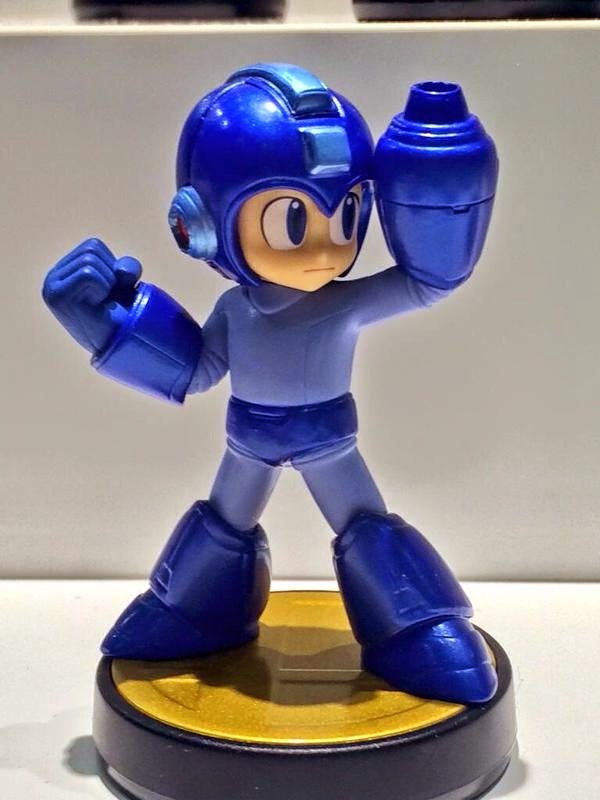 Lo and behold, the Mega Man Amiibo. This guy is due out sometime in February. I think. It's a bit confusing how Nintendo is handling wave 3. There's a lot of conflicting information out there so hopefully things will become more clear as we head into the new month. In any case, I hope you pre-ordered. It's sold out pretty much everywhere. Popular speedrunner Hetfield set a new world record for Mega Man X, besting the classic platformer in 35:54. The successful 100% run is due largely in part to a new glitch dubbed the "Magic Carpet." Demonstrated in the video above, this exploit makes traversing Storm Eagle's stage a breeze. The trick is accomplished by using Boomerang Cutter to grab the Heart Tank and quickly leaping backwards to the spawn point for the moving platforms. If done correctly, the game will mistaken the platform as your returning Boomerang Cutter. You'll now have a platform following you around, and you can wall jump off of it to blaze through the stage. The thing even saves you a great deal of time collecting the Sub-Tank and Helmet Upgrade, too. Simply fall down, hop back on and fly away. It's insane. You can check out Hetfield's record breaking run in action here. Challengers, good luck! 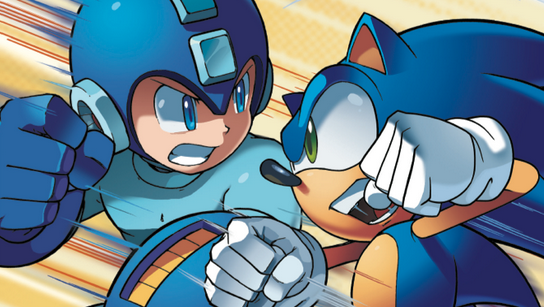 Want to catch up on Sonic and Mega Man: Worlds Collide before the next big crossover? If so, then you'll want to head over to Humble Bundle between now and February 4th. The entire crossover is up for grabs for cheap. You can set your price for volume 1 and unlock volumes 2 and 3 for a minimum of $15. DRM-free at a $149 value. In all, this is a terrific way to prime yourself for the next Sonic/Mega Man crossover, Worlds Unite. Proceeds will be allocated charity, specifically, The Hero Initiative (a not-for-profit organization dedicated to helping comic creators in need of financial support) and the Comic Book Legal Defense Fund (protects First Amendment rights of comic creators and readers). The Humble Archie Comics Bundle can be purchased here. 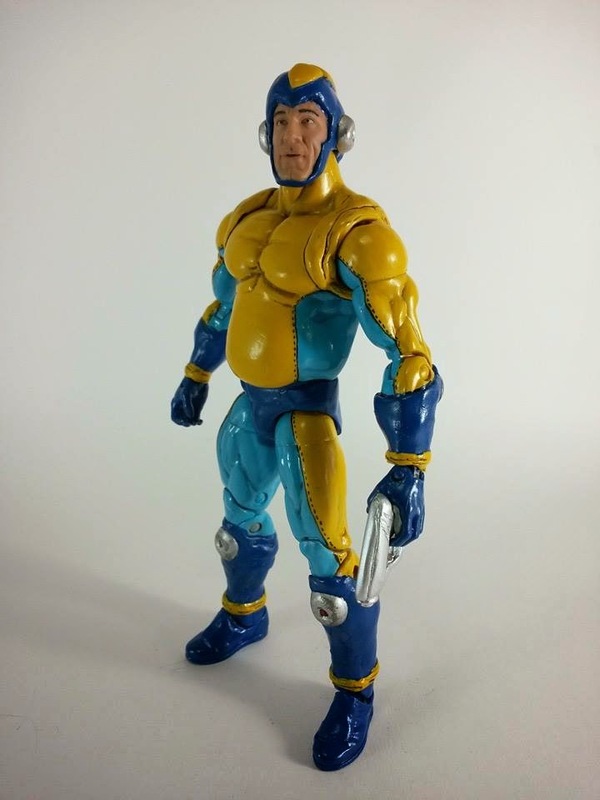 A few weeks back we got an early look at X-Plus Toys' new Gigantic Mega Man figure. Today it's up for pre-order. Right now, Amiami is offering the figure for 21% off the standard retail price: just ¥6,620 Yen (roughly $55.90 US). It's expected to ship in late March. The figure stands roughly at roughly 33cm tall, or about 13 inches. The body is composed of soft plastic with transparent plastic making up the Mega Buster power strip and helmet "ears." An alternate head sans helmet is included in the package. 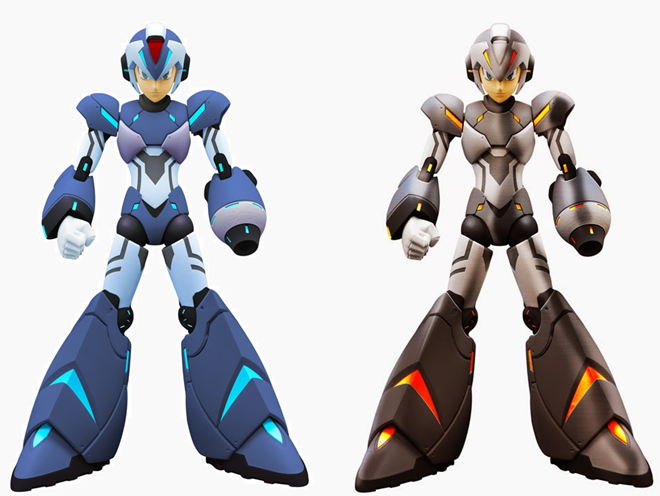 The Kickstarter for TruForce's officially-licensed Mega Man X figure went live today and it looks as stunning as ever. To get it off the drawing board and on to your shelf, they're going to need some help covering production fees. That's where you come in. Beginning January 23rd at noon ET, Half Empty E-Tank will be kicking off Mega Man-athon 3 at MAGFest. The 72-hour Mega Man marathon aims to raise money for Child's Play charity. As per usual, prizes will be had - full game download codes and even the chance to win a copy of Rockman 2 signed by Keiji Inafune. See he trailer above for all the details. Although we've seen a great number of Mega Man figures over the last twenty-something years, minor antagonists never got the figure treatment they deserved. Take Mega Man X3's Bit for example. He's a... a bit character sporting a pretty cool design. Aside from crappy gashapon, this guy hasn't received his due. 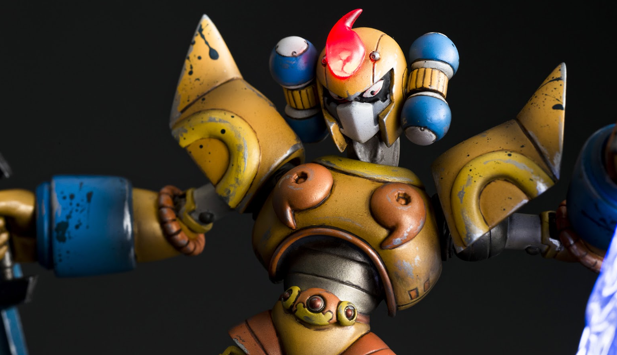 Taking matters into his own hands, custom figure designer Madhands answers the call once again. Lo and behold, Bit in all his golden glory. It has that official charm to it, stunning from shield to toe. Some very sad news from the world of voice acting today. 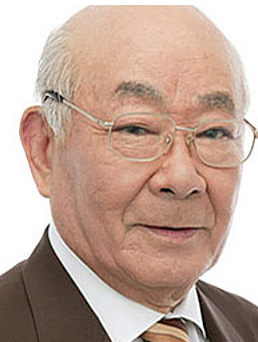 Legendary voice actor Chikao Otsuka died of heart failure on January 15th. He was 85 years old. Father of Akio Otsuka (Metal Gear Solid), Chikao Otsuka played a large number roles in video games, anime and dubbing for foreign films. His repertoire includes the elder Big Boss (Metal Gear Solid 4) and Dr. Eggman (Sonic the Hedgehog series). The role most well known to us would be that of Dr. Weil, the primary antagonist of the Mega Man Zero series. 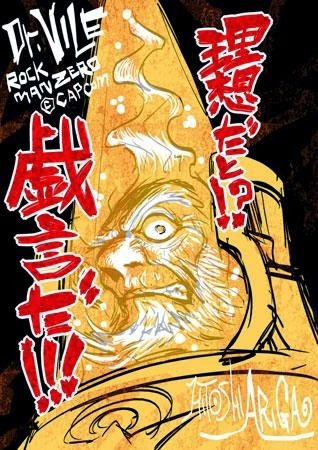 Otsuka portrayed Dr. Weil in Mega Man Zero 3, Mega Man Zero 4 and numerous Zero 4 drama tracks. My sincerest condolences to Mr. Otsuka's family, friends and fans. He will be greatly missed. The showdown to end 'em all is finally here! "The Ultimate Betrayal" Part Four: The cataclysmic conclusion! Dr. Light built Gamma to be the definitive answer to all global disasters—unfortunately it looks like all of its power might just be turned against poor Mega Man! As the battle rages, the entire castle stronghold begins to collapse. How will anyone get out of this one alive—and will they at all? Don’t miss the epic conclusion to this Mega Man 3 game adaptation storyline, featuring new cover art from fan-favorite Brent McCarthy and a special Capcom art variant! Five samples are available to listen to right here. 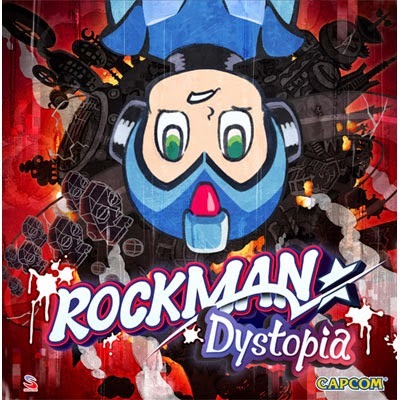 Rockman Dystopia ships February 11th. Looks like GE Animation is continuing to roll out the Mega Man merchandise. Next up on their list: A plush. And not just any plush. It's the crimsons crusader himself, Zero. 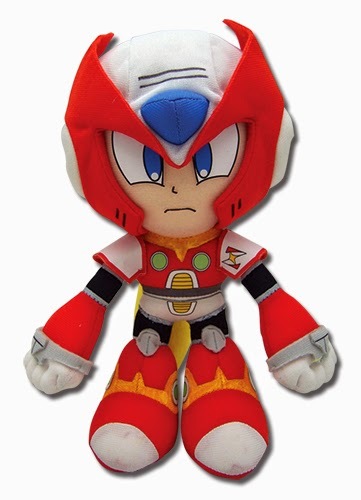 A perfect companion to a certain other plush Maverick Hunter. 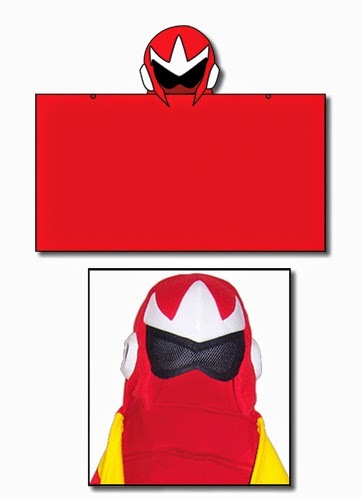 Also on the burner, a Proto Man throw blanket. The helmet (with shades) is attached so you can keeo your head and body warm simultaneously. This is certainly one of the more obscure products under the GE license. 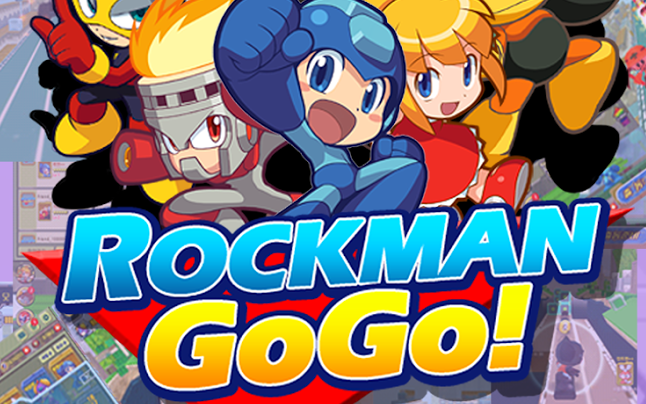 So you want to play that fancy new Rockman Go Go! but you don't have access to the Korean Google Play Store. No worries; I've ripped the APK. Here it is directly. I'll be attempting to update the link as new versions become available. If it goes down for whatever reason, let me know. By the way, if you don't have an Android device but still want to play the game, you can grab BlueStacks, a free Android emulator for Windows. You can only install through APK, however. I think you'll find the game itself to be pretty self explanatory. It's basically an endless runner, more so than Rockman Xover. Simply shoot and dodge obstacles while collecting tokens and power ups. That's it. Text is in Korean but that shouldn't present too big an issue. 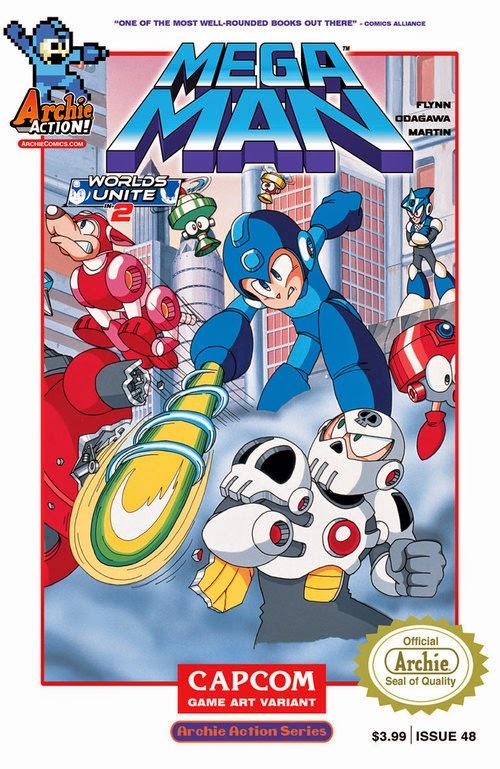 In recent years "bad box art" Mega Man has gone from a loathed atrocity to a hip and ironic icon. 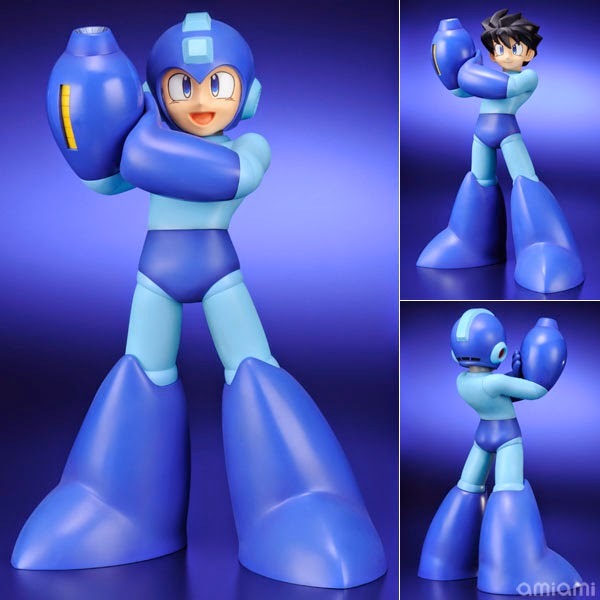 Mega Man 9's marketing and Street Fighter x Tekken brought the big guy back into the limelight, inspiring fan-art, parodies, cosplay, and now, as seen on ModxToy, a custom figure. An incredible figure at that. Only a few days into 2015 and we already have ourselves a new Mega Man game. Sort of. 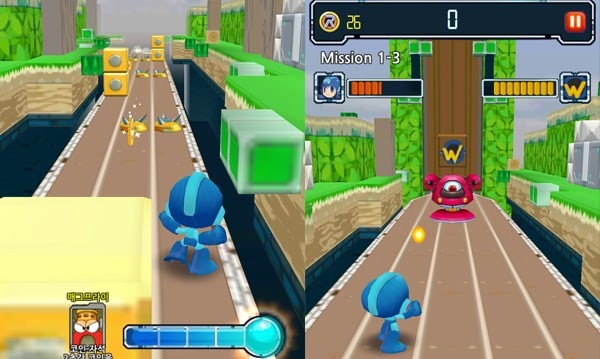 Rockman Go Go is an officially-licensed title developed for Android by South Korean studio Jenoi. It's available now from the Korean Android Market. Hit the jump below for gameplay. Love remixes of classic Mega Man music? How about a whole album full of them? You're in luck because Hyacintho Resilience is ready for consumption. This project was put together by a band of talented artists from across the fan community to celebrate 27 years of the Blue Bomber. The album consists of twelve tracks from all corners of the Mega Man universe, from classic to Star Force. What's more, it's chuck-full of exclusive fan-art (I'd argue the quality is right up there with the stuff from Mega Man Tribute). Best of all it's free. Head on over to the Hyacintho Resilience project site and give it a download. Props to all those who participated -- job well done! The Super Nintendo homebrew scene has been having a blast with byuu's MSU-1 chip. It's an aftermarket cartridge expansion chip (similar to the SuperFX) that allows native playback of CD quality audio. With it, modders were able to recently add streaming CD audio and full motion video to The Legend of Zelda: A Link to the Past. Natively! Today, the chip is breathing new life into Mega Man X.
Keiji Inafune and Comcept are ringing in the new year with a (very) brief look at a new Mighty No. 9 stage. It takes place in a mansion, complete with fancy lights and statues that are out to kill you. What's more, Inafune confirms Mighty No. 9 remains on track to launch later this spring. Development is essentially complete and they're about to enter the porting and promoting stage. We'll be seeing a lot more of the game in the months to come.